KappaTinning™ Compound is a dry mixture of pure powdered Tin and flux specifically designed for pre-tinning Cast Iron, Steel, Bronze, and Copper bearing shells. A one-pound container has about twice as much Tin and goes further than other tinning compounds. Case of 4 - 12.5 lb pails. 1. Pre-clean and degrease the bearing surface prior to tinning. Particular attention should be given to Cast Iron bearings to remove silica surface skins, graphite, and other residues that may impair adhesion. Kapp CopperBond™ Flux can be used to draw the impurities out of the bearing surface. 2. Pre-heat the bearing shell to approximately 500-550°F (260-288°C); (excessive heat may cause flux charring and premature Tin oxidation). 3. Sprinkle KappaTinning™ Compound on the bearing surface and vigorously wipe with a stainless steel wire brush or steel wool to yield a smooth, well-tinned surface to which Babbitt will readily bond. 4. 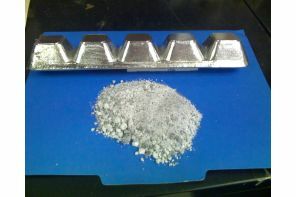 Flux residues are completely water-soluble and should be washed off promptly prior to Babbitt application. Keep container lid tightly closed when not in use. Store in a cool, dry place away from heat. Shelf life of this product is 1½ years if container is unopened. While KappaTinning™ Compound is not considered toxic, upon heating it will generate decomposition and reaction vapors. These vapors should be adequately exhausted during heating. Consult SDS for additional safety information.